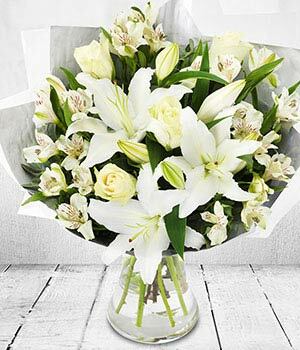 This stunning fragrant bouquet features white alstroemeria, roses and oriental lilies, brought together with tree fern flourish. These blooms make an ideal Christmas gift, delivered by courier to that special person that is too far away to spend Christmas with this year. The Celestial bouquet is delivered by courier in bud, it will then bloom in the home into a bouquet that will stay fresher for longer.